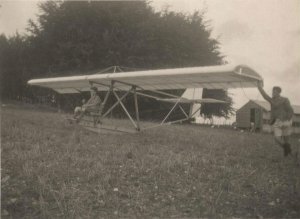 Although there had previously been isolated experiments with gliders, the feats of the Germans in 1921 and 1922 prompted the Daily Mail to organise the first British meeting on the Sussex Downs in October 1922. On this occasion world records were set up with flights of over three hours, but the interest aroused soon died away. The sport continued to progress in Germany , some of the best aeronautical brains being devoted to the task of perfecting sailplanes and soaring technique. In 1929 Robert Kronfeld and others made some remarkable cross-country flights using cold fronts and cumulus cloud currents. These flights again awakened interest in motorless flying, and the British Gliding Association was formed at the end of 1929. Gliding Clubs sprang up like mushrooms all over the country and were soon building primary gliders. 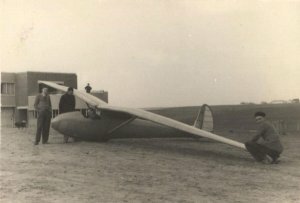 A further meeting on the Sussex Downs in June, 1930, from which Robert Kronfeld, the Austrian gliding ace, made the first British cross-country flight of fifty miles, greatly encouraged the movement. The College Club was formed in February, 1930, and enthusiasts set to work to build in the College workshops a primary glider known as "IC 1" to their own design). This glider was taken to the first camp on Salisbury Plain but was blown over and damaged before being flown. However, a grant from the IC Union enabled a second "primary" to be purchased, and flying began in January 1931. At the second camp in September no less than 120 launches were made, and among the certificates gained was an A (30 seconds flight) by the Rector. This elementary training continued all over the country, but the difficulty of finding sites and of building machines for more advance flying slowly cause the death of most of the club which had been formed in the 1930 boom. The College Club began to use the site of the London Gliding Club at Dunstable, and the more advanced members also used their machines. By the end of 1934 it became obvious that small gliding clubs must sacrifice their independence and amalgamate with the larger clubs if the elementary stage was to be passed and, after long discussion, the College Club affiliated to the London Gliding Club. With the services of a full range of sailplanes and of a full-time instructor the standard of flying improved rapidly. For the summer of 1937 a "Kirby Kite" sailplane was bought for the exclusive use of IC members and has since been flown by more than a dozen different pilots without any damage - and excellent record. Teams were entered for the British National Competitions in 1938 and 1939, at which some excellent flights were made and several awards won. In 1930 Imperial College students formed one of the pioneer gliding clubs and at the beginning of the war, when further gliding was forbidden, we remained one of the dozen active clubs in the country. 1st General Meeting of Imperial College Gliding Club (ICGC) – one of the seven BGA founder members (London Gliding Club is younger than ICGC by 1 day having had their inaugural meeting on Feb 20th). Captain: Colquhoun, Secretary: Adorjan, Treasurer: Jackson. Technical Committee of the club recommended building (i) Primary (ii) Secondary (iii) Sailplane. [Suggested budget for 1932-3 included the item Construction of Advanced Machine : £ 6-0-0 ]. Affiliation of ICGC to the BGA announced. President: Prof. Dalby, Captain: Payne, Secretary: Adorjan, Treasurer: Jackson. Primary (I.C.1) (otherwise known as the "Incredible") constructed in C&G workshops and J.H. Payne's garden at Hanwell. The I.C.1 was designed by Payne. Materials for I.C.1 were given by the Rector, Sir Henry Tizard, and members Jackson and Adjoran went to the Wasserkuppe. Colquhoun resigned captaincy as he couldn’t attend camp. First summer camp at Gore Farm, near Shaftsbury, having been granted permission by the farm's owner, Mr. Ralph Gardiner. An Instuctions & Regulations document was printed and a letter regarding the camp was produced. Quote:- No alcoholic drink may be may be brought into the camp. No person may fly if, at any time previously during the same day, he has had any alcoholic drink. Members are reminded that gliding is a sport requiring extreme fitness of mind and body. A plain healthy diet should be followed: drinking and smoking should be cut to a minimum. J.H. Payne, whose enthusiasm was a great help in the early days of the club, was elected Captain. The arrangement of the camp at Gore Farm was that members paid for their food and worked for the farm part of the day to pay their rent. Contemporary photos show them grappling with some magnificent agricultural machinery. The I.C.1 was completed but blown over in a high wind. Hewson was sitting in the seat keeping the machine down whilst the bungy was being laid out. On being blown over, the plane pivoted on Houlder’s chest and dumped Hewson on his head. He was put to bed and his trousers taken away to keep him there. OK in a day or so; the plane was taken to Gore Farm with the inverted fuselage made into a trailer and towed by a car belonging to Dr. Barnes, father on one of the members. The wheels of the trailer were bicycle wheels and gave trouble due to overloading. The trip from Hanwell to Gore took 8 hours, the ensemble having passed a penny-farthing on the Great West Road. A report of the 1930 camp was written. I.C. Union grant £75 for the gliding club to purchase a primary. R.F.D. Primary delivered and paid for (several other clubs never paid for theirs). There was also a posh canvas cover for the trailer and glider, which lasted for a long time. Membership about 35. Articles in Dorset Club’s yearbook – How gliding in taught at the Wasserkuppe by C. H. Jackson and Constructional Work by J.H. Payne. I.C. II (R.F.D) first flown at Wembley (I.C. sports ground). Annual dinner, 40 attended including Prof. Bairstow, (Rector & Head of Aeronautics), Sir Gilbert Walker (Head of Meteorology) and Gordon England (BGA Chairman). Toasts, music! Colquhoun crashed the RFD at Lyon Farm. Repaired by Dagnall for £15. Prof. Bairstow and Fred Handley-Page gave lectures. Back at I.C. sports ground, Wembley. To Smalldole (ground of sailplane club of TMAC) on South Downs 12 miles north of Shoreham. Prof. Fortescue came to time A’s – but only did 24 seconds! Nights in rat-infested barn. 4 A’s at Balsdean – the first certificates (observed by York Bramble of the Southdown Club). Adorjan replaced Payne on BGA Council. I.C. 1 repairs began, but never finished. Weekend flying at Kingsbury (North London, near the Welsh Harp) until 10th May 1932. Mention should be made of the Misses Brown and Dodsen who flew at Kingsbury quite a bit. Miss Brown was so light that she had to carry a vast weight of 16 lbs (a bit of cast iron from the C&G scrap heap) to keep the nose down. She was given to flying in circles and several times performed the feat of landing at her starting point from a bungy launch. Balsdean Whitsun meeting including spot landing competition. AGM. President: H. T. Tizard, Captain: Adorjan, Vice Captain: Keeble, Secretary: Dean, Treasurer: C.H. Jackson. Plans and flying regulations for 1931 camp issued with a letter in regards to the camp. 2nd summer camp at Gore Farm. To these early camps came a succession of eminent visitors, including Sir Gilbert Walker, with boomerang. An entry in the diary of the 1931 camp reads brushed out hair and put on clean shirts ready for the Rector . Notes and a report of the 1931 summer camp were produced. First auto launches took places in Longcombe Bottom, by Gore Farm. Hewson flew through hedge and broke I.C. II. Eight days of repairs. Keeble got first 'B' for club (61 seconds). Henry Tizard, later knighted, led the British Aeronautical Research Council through most of World War 2 and led the 'Tizard Mission' to the US on behalf of Winston Churchill and the British government. He was a great figure in British scientific and engineering history and ICGC are proud that he flew with the club and served as its President. Keeble did 97 seconds at Win Green, near Gore Farm. Totals for camp: 120 launches, 5 A's, 3 B's. Sir Gilbert Walker lent £20 to buy an old red bullnosed Morris Oxford. Guests at the camp included Sir Gilbert Walker., who flew, G.T.R. Hill and family and several German students (photo Sailplane 14th October 1931) who later made experiments with Prof. Georgii on catching thermals by watching smoke. G. T. R. Hill was the Westland Pterodactyl man, after the war he was Prof. of Mech. Eng. At University College, London. About this time several members went to the international meeting at Balsdean and helped in the competitions there. Adorjan’s article in "Sailplane" on "Rocket Propulsion"
First visit to Dunstable. Payne crashed I.C. II (RFD) through doing a downwind turn on takeoff (S.W. wind). Proposed I.C. II to be cancelled and a Dickson primary be bought (Avro wings). Thurston James elected honorary member of ICGC (Thurston James was editor of "S&G", later "Aeroplane Spotter" and, after the war, of "The Aeroplane"). Lecture "Clouds" by Sir Gilbert Walker. I.C. photo at Preston published in "Sailplane". Dickson primary failed to rise and was abandoned. Lecture by Lewitt on "Design of Gliders" (see S&G) [Lewitt was a Prof. of Mech. Eng. at I.C.]. £50 grant from I.C. Union, decided to buy I.C. III, another RFD, from Methyr Tyfdil. Fuss about car bought for 1931 camp (it lasted for years). Christmas camp at Balsdean. 3 A's, stayed at Rottingdean pub. New Welsh RFD used. Power section of club discussed. "Sailplane" article by Adorjan on Acceleration test of a glider (re. bungy launch). Imperial College Rector writes to Mr. Spencer of the London Aeroplane Club, Stag Lane Aerodrome, Edgware, to enquire whether it is possible to secure aeroplane flying training for ICGC members at reduced rates. Lecture on "Meteorology" by Captain Entwistle (see March 15th "Sailplane"). Joint film shown with I.C. Motor Club (minute book said "possible talkies"!). Sub. raised 21/- to 30/- with 10/- extra for "Secondary Section". Long and acrimonious discussion. Keeble built rear half of RFD nacelle fairing ("side whiskers") in Bessemer laboratory of Royal School of Mines. Easter camp at High Titton, Storrington: front half of nacelle fitted. 12 members, 70 flights. 9d/meal, 3d/flight, 25/- profit. Instructions for the 1932 Easter Camp and Flying regulations drawn up. Keeble got 'C' at Dunstable, 15 1/4 minutes in I.C. nacelle. Visits to Dunstable and negotiations for advancing flying. "Sailplane" article "Club Balance Sheet" by Adorjan. Jackson elected to BGA Council. A.G.M., Adorjan’s report gives IC 8 B's, 20 A's, 44 members to date. President: Sir G. Walker, Captain: Keeble, Secretary: Colls, Treasurer: Jackson. Adorjan writes Report on Imperial College Gliding Clubs Activities . 1931-32 budget prepaired. Third summer camp at Gore Farm (see "Sailplane" Nov. 25th). Pollard crashed in ordinary Dagling. Another primary bought from Nottingham G.C. Keeble's super nacelle finished and flown. Colls tried soaring but crashed new nacelle and broke his ankle. Quote from Keeble pulverising my precious, beautiful nacelle . I.C. regularly at Dunstable with an RFD, a nacelle and an aircraft referred to in the "Sailplane" as the "S. Kensington". No records of such a machine. Photos in "Sailplane" of Keeble in nacelle. Letter in "Sailplane" on "Pulley Launching" by Keeble. There was an Easter camp at Dunstable in 1933 and a good deal of auto launching was done in persistent North winds. The original club tent distinguished itself by collapsing, the pole going through the top. For the next year the affixation was by an old dope can on top of the pole. Quotes: Eric Collins - Keeble, don't send any more of your wizards off today, please ; Major Petrie – Who perpetrated that flight? Colls now representative on BGA Council. A.G.M., Captain: Munro, Secretary: Colls, Treasurer: Rainey*. 1932-33 budget prepaired. I.C. hangar commenced at Dunstable. Cost £107-10-0 paid by I.C. Union. Completed at July camp after some trouble with local surveyor. *Rainey, after the war, became boss of the British anti-locust effort in Africa, Fellow of the Royal Society etc. A.G.M., President: Sir G. Walker, Captain: Munro, Secretary: Colls, Treasurer: Rainey. Luton Rural District Council give planning permission for ICGC to erect a Glider Hangar, the shed shall be coloured green with white window sashes, felt roof to be tarred and sprinkled with light coloured grit . Hebden's famous crash on hillside road at Dunstable. "Sailplane" letter from Hebden on "Auto-launching with a small crew". "Sailplane" gives some I.C. notes. Secretary: Lee. Mr. Camber of Windsor presented a partly complete glider (1923 vintage), in mahogany. Too heavy to be finished, never flown. Thereafter known as "The Present from Windsor". Club car bought at 1931 camp still functioning. A swap for a Buick discussed and put through. This turned out to be a white elephant and was sold as scrap to a firm of Dunstable junk dealers. A.G.M., President: Prof. Pippard*, Captain: Munro, Secretary: Colls, Treasurer: Rainey. * Prof. Pippard was Prof. of Civil Eng. after the war. I.C. camp at Dunstable. 1 A, 2 B's. Hebden spun in an open Dagling after 8 minutes. Amalgamation with London G.C. discussed and finally agreed to after fierce opposition. "Sailplane" I.C. notes mention 2 primaries, hangar and use of London G.C. clubhouse. BGA subsidy secured - by certain clubs. Amalgamation completed. Subs. paid in aircraft and accessories. £33 over towards a sailplane. Club records: Keeble, 0.5 mile, 200 feet, 15 minutes. A.G.M., President: Prof. D. Brunt, Captain: Rainey, Secretary: Holt, Treasurer: Chirgwin. Hervey gets A, B and C certificates at L.G.C. camp. I.C. hangar nearly blown away. I.C. credited with only one 'C' in 1935 (Rainey). Pfeister (German student) gets A & B. Keeble working for Zander and Weyl. A.G.M. President: Prof. Brunt, Captain: Rainey, Secretary: A. B. Wilkinson, Treasurer: Orchard. Brunt lectures to the club on meteorology, Hervey is permanent instructor at Dunstable. Discussion of hiring a sailplane for National Comps at Bradwell Edge (didn't come off). LGC agrees to buy sailplane for I.C. exclusive use. I.C. pay 30% (70% subsidy). Fourtnight camp at Dunstable. I.C. 's new Kirby Kite is delivered and flown by bungy and auto launch (see The Sailplane, May 1937, p.112). Many photographs of this Easter camp came back into the club’s possession in 2004. A.G.M., President: Prof. Brunt, Captain: K. G. Wilkinson, Secretary: A. B. Wilkinson, Treasurer: Cowley. Club's badge tally stands at 37 A's, 23 B's and 8 C's. Ken G. Wilkinson obtains ICGC’s first Silver 'C' with a flight of 43 miles from Dunstable to Croydon. A. B. Wilkinson achieves 3,500' and Rainey does 5 1/4 hours. Easter camp at Dunstable, in caravan and tents. Poor weather. A.G.M., President: Prof. Brunt, Captain: Naylor, Secretary: Yates, Treasurer: Riley. Naylor and Inglesby obtain 'C' certificates. ICGC enters the National Contests at Dunstable for the first time and gained fourth place in both club and team events. Flights included A. B. Wilkinson to Duxford on July 11th, K. G. Wilkinson to Cambridge on the 13th and A. B. Wilkinson to Wheathampstead on the 17th. Chirgwin wins 5 guineas for duration. Impatience at slowness of pre. B instruction at Dunstable produced discussion of possibility of University of London G.C. with primary site for winching near London. Cost too great. Easter camp at Dunstable in new hut and tents (hut replaces the now decrepit caravan). Poor gliding weather until last weekend when Yates, Moos, Davie, Fletcher and Brooks obtain ‘C’ certificates. A.G.M., President: Prof. Brunt, Captain: Riley, Secretary: Yates, Treasurer: Moos. National Competition at Bradwell Edge. Allowed to enter on promising to pay 100% of damage. 3 cross countries in very bad weather. Machine undamaged in spite of stone walls. Won some daily prizes; team consisted of K.G. Wilkinson, Chirgwin, Riley, Naylor and Crease. I.C. visit to Poland planned but war depleted visitors. London G.C. carries on in spite of war until stopped on November 21st. ICGC resumed gliding operations again in 1946.